Are You Showing Yet? Yes, I am massive. Total Weight Gain: Around 11 pounds still. Maternity Clothes? Nothing new, still making do with what I have in the wardrobe. Sleeping: Not been sleeping very well for a couple of weeks now, wake around 3 or 4 times during the night either in pain or desperately needing the toilet. Food Cravings: Popcorn chicken from KFC. Anything Making You Sick / Queasy? Nope. Movement? Moves all night and day. Little fidgit bum. Symptoms: Lack of sleep and alot of pain in back and pelvis. Ring On / Off? On. Mood: . Been a little bit emotional this week. Starting to get a bit fed up of no sleep and being in constant pain where the baby is pushing down on my pelvis and trapping a nerve. Best Moments This Week: Seeing his face for the first time at a growth scan appointment. Up until now he has hidden from us at every scan and we have only been able to see him bum. Finally got a picture of his face. Looking Forward To: Birth. Just want my boy in my arms now, pregnancy is not treating me well at all. So on Wednesday we had another growth scan appointment to see how the baby was growing and to see if he had put on any more weight since his last growth scan. Normally when we go for a scan baby hides so we cant see his face, he doesn’t make it easy to be measured and he generally just squirms around away from the ultrasound. 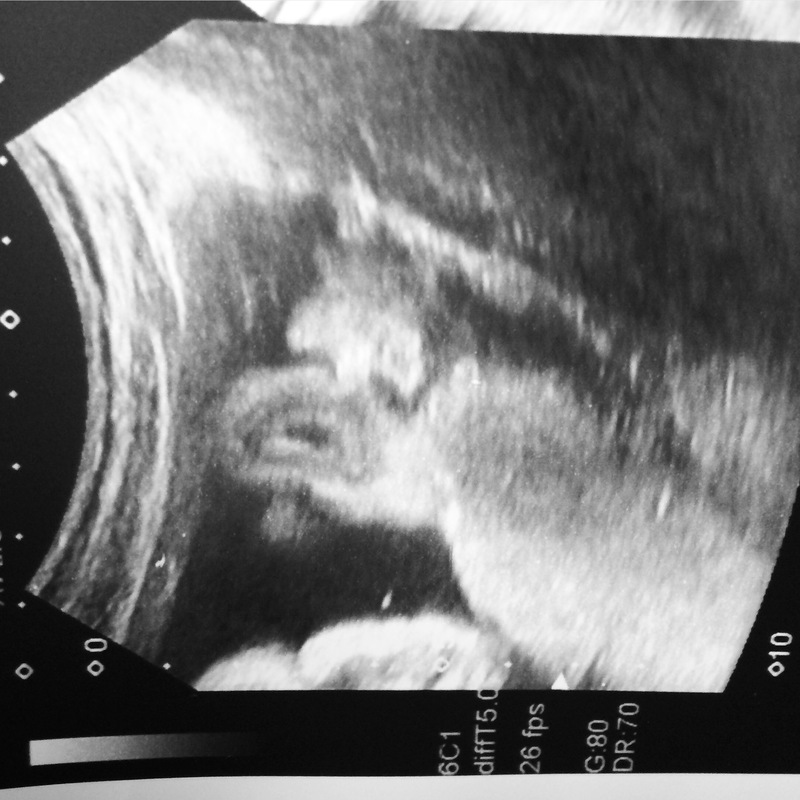 This week baby played ball, we got to see his face and the sonographer got all the necessary measurements. After having the scan, we had an appointment with the consultant who informed us that they are now worried about baby because he is too big (I know right, first too small, now too big). I literally don’t think we have had one easy step during this pregnancy, it has been one thing after another. On Tuesday I have to have a blood test and a glucose tolerance test to see how my body reacts to sugar levels. They want to check that neither me or the baby have diabetes because of his rapid growth spurt in the past 4 weeks. I have also been booked in to have another scan in 4 weeks (3 weeks before due date) to see what his growth is like then and to determine how I am able to give birth. Hopefully *fingers crossed* everything will be ok and I will still be able to have my water birth as planned. Ill keep you all updated and let you know what’s said after the blood tests.